The Forbidden Gospels: Creating Jesus: To Chalcedon? Just want to say that I look forward to each new post in this series. I have no background in biblical scholarship. Just happened to follow a link here one day and kept coming back out of curiousity. Yeah, but he wasn't claiming it for himself, was he? That was the point. Deutero-Isaiah was speaking in God's voice. It's hard to believe Jesus is supposed to be doing that when he says that "I and the Father are one." 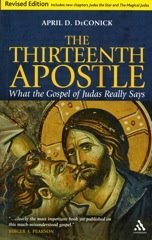 And surely if the author of John had meant that Jesus was speaking for God he would have used the trope like the Deutero-Isaiah prophet did something like "... This is what the LORD says to his anointed..." Again, though, it is hard to see that squared with "I and the Father are one." Good points, but I think the possibility is being overlooked that "I and the Father are one" is a declaration of unity rather than identity. Unity is, after all, a key emphasis in John, and the unity between Father and Son serves as a model for the unity of Christians, who are supposed to be "one" in precisely the same way that Jesus and the Father are said to be "one", the language of indwelling coming up in that context. As for the "I am" language, I understand that to basically be a claim similar to the Samaritan one (made much later) that Moses was vested with the divine name, the key difference being that in John we have the one to whom the name is given depicted as speaking in the first person. Having made these points, I will add that I'm very much open to the possibility that John has moved beyond, and perhaps far beyond, an "inspiration" model of Christology. But I think that it is a crucial part of the author's heritage, at the very least, and reading the Gospel through this lens will help us (if nothing else) see how John's Christology builds on and works with earlier Christological motifs. I can certainly do this...but I don't want to bore my readers with the same subject for an extended period of time. I can cover all the controversies to Nicaea, Nicaea, and its fallout, but only if this is something that will interest you. I would be interested in how Christology developed through Nicaea and Chalcedon. I'd like to know if there were other viewpoints rather than Athanasius and Arius', for example, on what constituted God. I also think the statement of Jesus that "I and God are one" means in unity. John 17 clearly makes that point, as he also prays that the disciples may be one in him, as he is in the Father. Unless we're going to go into some esoteric idea that we are all going to become part of the substance of the Trinitarian God, then we need to take such statements in context. I am slowly catching up on your posts, having been in hospital for some weeks, but I join with others in urging you to continue.